For the fifth year in a row, we will hold a memorial walk in Haleyville on May 16, 2015, in Mark’s honor. This is the same day as the 5k/10k/half race (you can’t do the walk and the race). For anyone who wants to participate, it will begin 6:00 am and will be a continuous 34 miles in honor of Mark’s 34th birthday, which is May 15. The route will begin and end at Haleyville High School. This is a personal walk for me and it’s not about the money or participants; it’s about remembering our brother on his birthday, and putting myself thru some pain in his honor. We welcome anyone who wants to participate. The entry fee is $40 and supports The Mark Forester Foundation. We will carry the same baton as previous years. We anticipate the walk taking about 13 hours. There will be staging areas every 5 to 7 miles with water. The route will be posted in the coming months, before the walk. 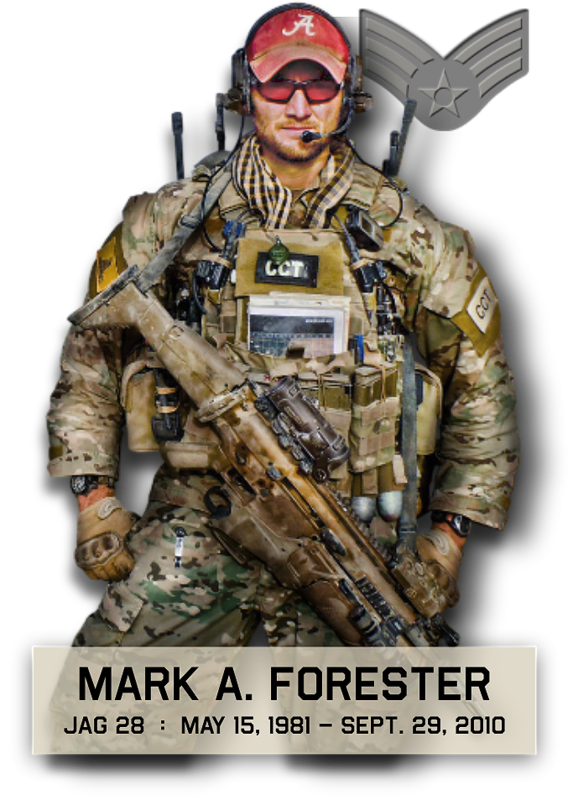 The walk will include a stop at Mark’s grave where we will perform Memorial Push-ups. Then a pass by the flag pole in front of our parent’s house. The flag atop the pole has special meaning because it’s the flag that Lt. Col. Frank Latt had in the cockpit with him while providing Mark air support on his final battle. Frank presented this flag to us shortly after his return from deployment (which was captured on Lifetime’s “Coming Home” show in 2011). T-shirts are provided by T-Riffic Tees. We thank them for their support. The below picture is the group before starting at 6:00 am last year. It was in the 40’s and raining, but finally cleared up and was perfect weather after lunch. 1. Start using the shoes/boots that you plan on using for the Ruck March, NOW!!!!! This also applies to pants, shorts, shirts, cold/hot weather gear you plan on wearing. Don’t let there be any surprises pop-up 10-15 miles into the march. DO NOT SHOW UP TO THE MARCH WITH UNTESTED GEAR, you WILL pay the price if you do. 2. Start using the socks you plan on marching with, figure out what works for you i.e. wool socks with a liner, ankle socks, or two pair of liners. Whatever you like, USE IT, TRAIN WITH IT. 3. BACKPACK. If you plan on carrying one, just as the first 2 tips, start using it during your training NOW. NO SURPRISES. 4. Start putting together a first aid/BLISTER kit, some suggestions include, but not limited to; mole skin, band aids, blister patches, Vaseline, sunscreen, Chapstick. As you continue training you will probably start to think of things to add. Also get smart on blister treatment, you can Google it, there will be a lot of guys that can help you during the march but it’s always nice to be self-sufficient if needed. 5. When training for the march, Never run or jog with your pack. Have fun training, get outside, crosstrain, train your whole body. Slowly work up to the march. Start with lower mileage and work up, 2-3 marches a week at varying distances will be good, once again, HAVE FUN. 7. FOOD; during the march you will want to snack on a variety of food/power gels/beef jerky/snacks, start eating and experimenting with the snacks you like during training, this will identify any bowel problems you might or might not have while walking 34 miles at one time. Diarrhea/upset stomach is not your friend during a ruck march.